Please write “BILL ERICKSON” on the check memo line or in the memo or account field in your online bill payer. Hello! 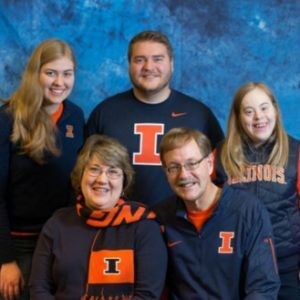 My name is Bill Erickson and I am directing IFI’s outreach at the University of Illinois in Urbana-Champaign (UIUC). My wife, Donna, and I look forward to serving the ever-growing international community in this area. The international enrollment at our university has exploded in recent years to around 11,000, with over 100 countries represented. The UIUC now has one of the largest international student populations in the nation, with one in four students coming from another nation. We also have nearly 2,000 international scholars visiting our campus to further their academic careers. Many of them bring their families with them. It is amazing to have this huge global gathering right here in the midst of the corn and soybean fields of East Central Illinois! Donna and I both earned degrees from the University of Illinois. Even before we knew each other, we each had a desire to reach out to people from other countries with the love of God. The Urbana missions conferences were still being held in Urbana when we attended the UIUC, and they fueled our desire to serve the Lord in a global dimension. When we were married in 1988, we sensed that God had brought us here for His international purposes, and we decided to make our college town our home town. Since then, we have worked in the community and raised three wonderful children; Amy, David, and Alise. Over the years, we have found opportunities to reach out to international students in our free time through hospitality efforts, home Bible studies, and outreach activities. In light of the tremendous increase in the numbers of internationals now streaming to our campus, it has been our desire to become even more focused in reaching out to them. When the invitation from IFI was presented to us, it answered the longings of our hearts that we have had for many years. We look forward to this exciting opportunity to share the truth of God’s redemptive love with our international guests. As we reach out to this campus as a team, we hope to see the Body of Christ coming together in increased unity in response to Christ’s commission to go into all the world – one that is being brought right into our very midst. Now is the time for us to labor in this harvest field with a unified effort! Will you join with us, in this amazing opportunity to reach out to the nations on this campus, through your volunteer participation, prayers and financial assistance? We can only do this effectively as we partner together as a team!